First up, we tell you about Ice Escape. A convention happening here in Phoenix for new writers and under-published authors. Don't miss this event. 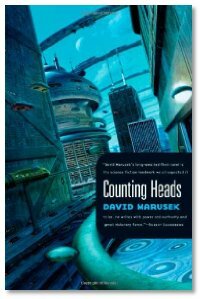 After that Michael and Evo talk to David Marusek about his first novel, Counting Heads. David is a short story writer that is taking his first steps into novel writing. A good conversation with an author working his way into bigger things. In the Library this week we talk about some of the titles that have made their way into the studio. Hmm, you know, for all the books I hear from the Library, there most be many that are unfortunate to not be covered, either from lack of time to talk about in the segment, or because you never received a copy. So my question to you guys is this: what books out the of ones that never made it in, would you have wanted to cover, given the chance to do so? I'll have one of what she's having. Ignore the above, mist-posted it; the meds just kicked in. I'll have one of what he's having! also neat to hear that this book spawned from an earlier short story. I don't recall, but was it mentioned where this story might be picked up at? Where the story might be picked up... repeat after me "Google is my friend"